^ 本軍沿革. 中華民國陸軍司令部. 2013-04-22 [2012-06-21]. 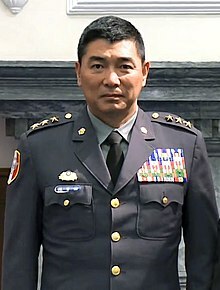 （原始内容存档于2011年2月17日） （中文（台灣）‎）. 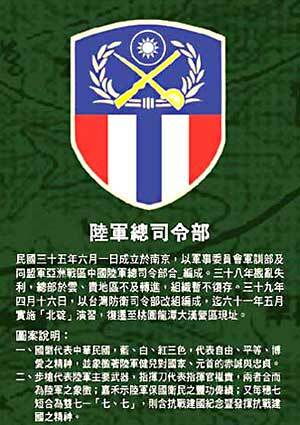 ^ 陸軍總司令部隊徽. 國軍歷史文物館. 2013-04-22 [2012-06-21]. （原始内容存档于2014-09-24） （中文（台灣）‎）. ^ 內政部役政署首頁 » 常備役園地 » 新兵訓練中心 互联网档案馆的存檔，存档日期2014-01-23. ^ 12.0 12.1 12.2 12.3 12.4 armstrade.sipri.org. armstrade.sipri.org. [2010-01-10]. ^ www.defense.gov. www.defense.gov. [2010-01-14]. （原始内容存档于2010-03-01）. ^ Aviation & Special Warfare Command. Globalsecurity.org. [2007-07-16]. ^ ROCMC's 66th Brigade Receiving New Tanks. [2010-11-23]. ^ 30公厘機砲型雲豹甲車　陸軍證實：量產284台. yahoo!新聞. 2018-10-24 [2018-10-24].